I’m not writing about back exercises because I have the strongest back ever. I’m writing because I used to have the weakest back ever. Since incorporating these exercise into my regular routine, I’ve noticed an increase in back strength, which is exciting for someone who used to have none! did you know that your core and your back muscles go hand-in-hand. Working your core but neglecting your back may cause back pain. For me, that’s exactly what happened. Well, that and a lot of other things including a pinch of bad luck (in my opinion). Many of us want to do crunches and planks galore, but we forget that working our back muscles is equally important! So without further ado, let’s get to it! Stand with your feet together, knees slightly bent, one dumbbell in each hand. Bend your elbows and bring the dumbbells up near your shoulders, and then straighten your arms back out so that the weights are slightly behind you. These WILL work your triceps, but if you squeeze your shoulder blades together when you bring the weights back behind you, it will also work your upper back muscles. Remember to keep your gaze down to the floor so you don’t strain your neck from looking up! I don’t know if this is the technical name (I’m not a personal trainer), but this exercise hurts so good! 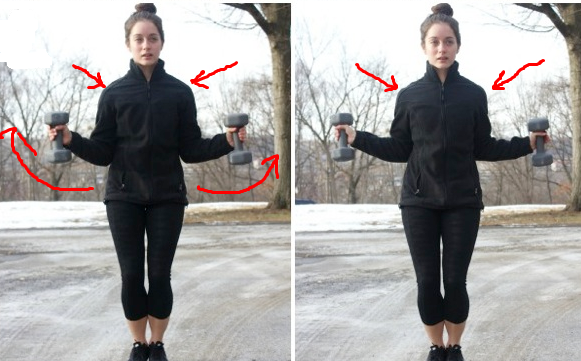 Stand with your feet together, knees slightly bent, holding a dumbbell in each hand. Assuming your body is a clock, bend your arms so that your left arm is facing 11 o’clock and your right arm is facing 1 o’clock. Keeping your arms at that level, squeeze your back muscles tight and move your arms back slightly. They won’t be able to go very far, but you should feel it working your shoulders and upper back.